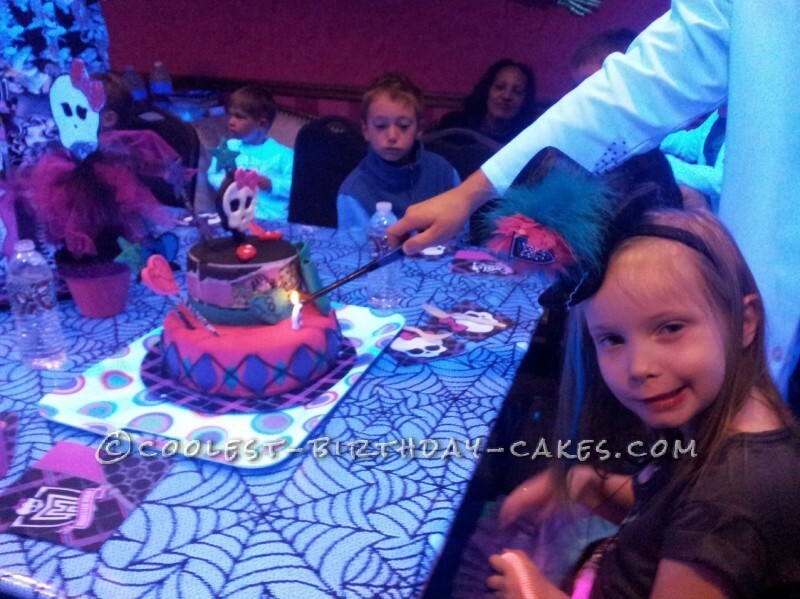 For my daughter’s 8th birthday she was torn between having an America Girl doll party or a Monster High Party, two very different parties with two very different types of cakes. While I, personally, like the American Girl dolls more than the Monster High dolls, I knew ultimately a Monster High Cake would be more fun to make. So when she chose that theme I was really looking forward to designing the cake. I took my inspiration from the fun colors of pink, purple, turquoise, & black used in the Monster High toys along with the Monster High original icon Skullete. A couple of days before the party I made all the fondant decorations to give them time to harden and be firm and pressed them into lollipop sticks I had covered in Monster High patterned tape. When is came time to make the actual cakes I made 2 -10″ chocolate cake layers with a chocolate hazelnut Bavarian cream filling and also 2 – 6″ white cake layers with a vanilla Bavarian cream filling. I frosted both cakes in a yummy pink butter cream, since it is my daughter’s favorite color, even though it would not be seen under the fondant. I covered the bottom cake in a hot pink fondant and the top cake was covered in black fondant. I made sure that the bigger cake was chocolate since at her party last year I made the vanilla the largest and all the kids wanted chocolate which was a change from the previous year. True to last year, chocolate again was the favorite but I made vanilla cupcakes too, just in case the vanilla cake was not enough. Once I had all the cakes covered in fondant and stacked it was time for the fun decorating to begin. For the bottom cake decorations, I wanted to match the Monster High print, so I cut out diamond shapes in both purple and turquoise fondant and added black licorice rope to tie it all together. I added another black licorice rope around the bottom of the cake to give it a nice clean look. 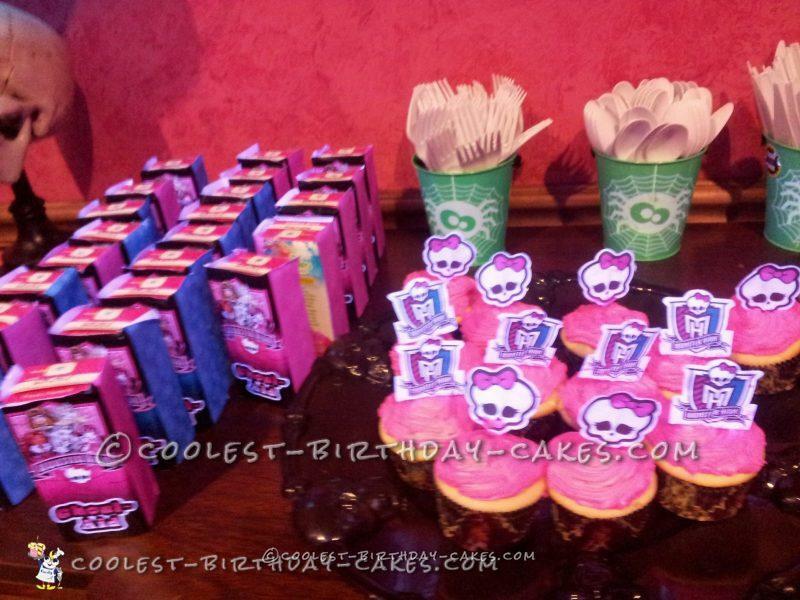 For the top cake decorations, I used a icing sheet that had been printed with edible ink with the Monster High girls on it. I ordered the sheet online and while it was my first time using one of these, it was super easy to apply and my daughter was so amazed when she saw it! 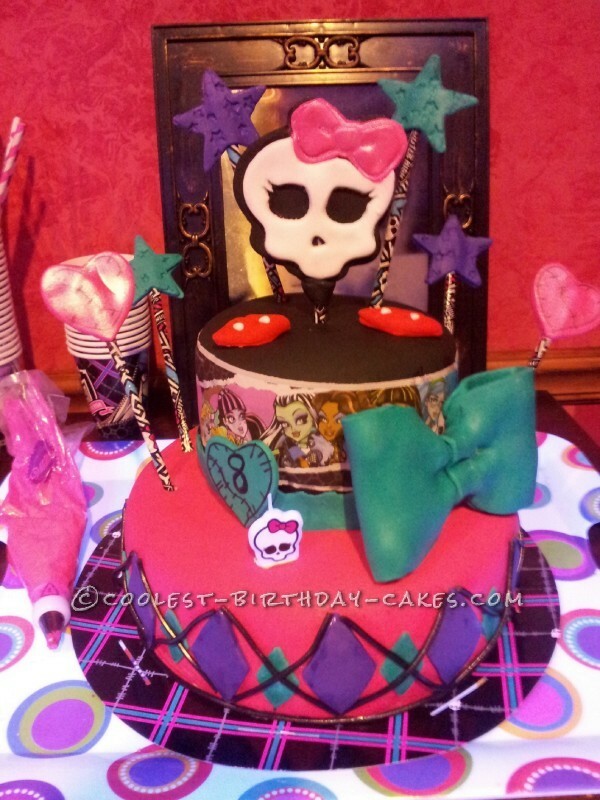 My absolute favorite part was the fondant Skullete topper , I used a 3-D fondant cutter with white, black, and pink fondant and I added pink shimmer to her bow to really make her sparkle. 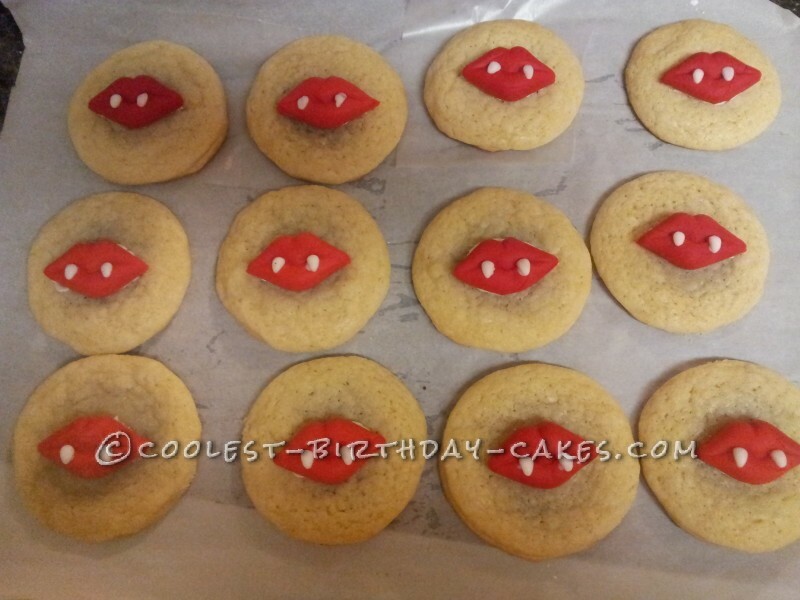 The purple and turquoise fondant stars were rolled out on a star imprint mat so the stars had star patterns and I added more pink shimmer to the pink fondant hearts, the vampire lips were made in a fondant mold with red and white fondant.